This casserole was super delicious. 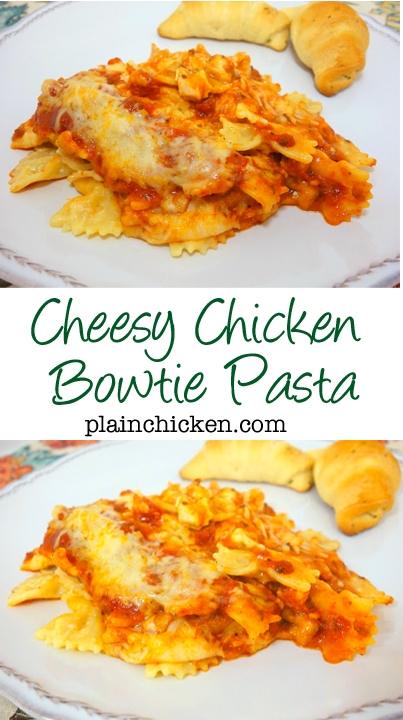 It was like a chicken mac and cheese topped with spaghetti sauce and mozzarella cheese. It sounds weird, but the flavors really worked together. To cut down on the prep time, I used a rotisserie chicken in this casserole. This can be assembled ahead of time and heated up when you are ready for it. This makes a ton; it would be great for a crowd. If you don't have an army to feed, no worries. It is great reheated. You could also divide this into two pans and freeze one for an easy weeknight meal. This is something that I will make again and again. Prepare pasta according to package directions. Drain and place in a large bowl. In a medium saucepan, melt butter over medium-high heat. Whisk in flour and cook 1 minute. Slowly whisk in milk, salt and pepper. Keep whisking until smooth. Bring mixture to a boil, reduce heat and stir in cheddar cheese until smooth. Pour cheese sauce over pasta. Stir in chicken. Spoon pasta mixture into a lightly greased 9x13-inch pan. 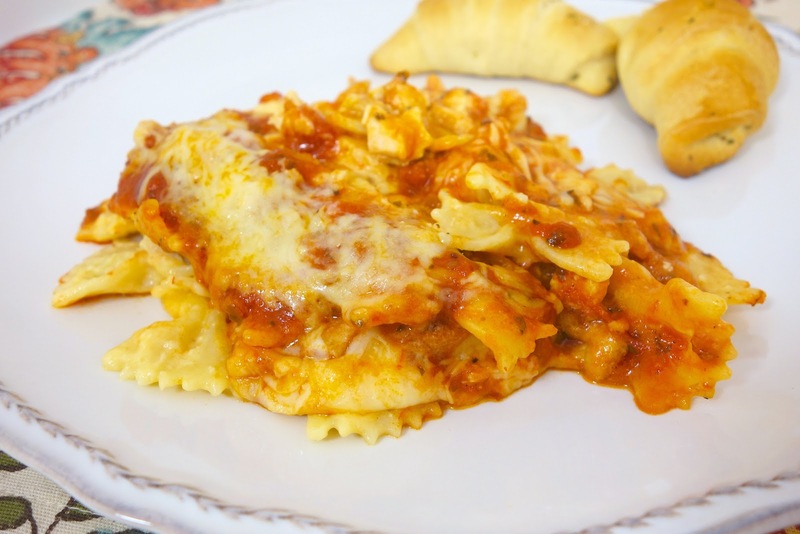 Pour spaghetti sauce over pasta and top with mozzarella cheese. Bake 35-40 minutes, until bubbly. Steph: to freeze half, would you freeze it uncooked? YUM! There's nothing better than cheese and chicken together! "Pinning"! Lynne- if you freeze it, assemble it and then pop it in the freezer. Don't bake it first. So cheesy and delicious sounding! Making one...and freezing one. Looks so good!! Perfect for a night when cooking time is limited. Made this last night for dinner. Unfortunately, DH and I thought it was very bland tasting. It definitely needs more seasonings added other than what is in the jar of spaghetti sauce. 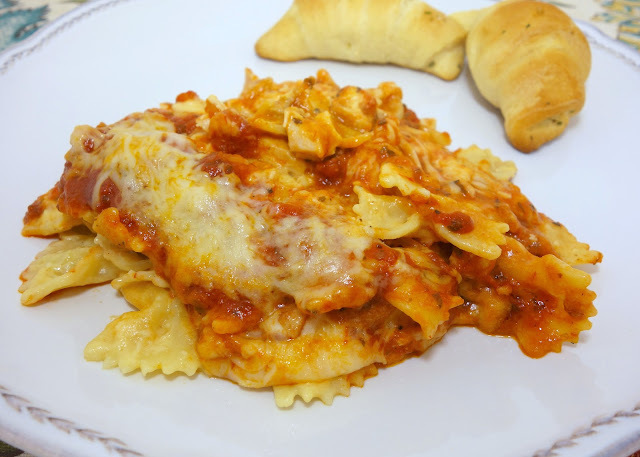 My youngest DD didn't think it sounded good with the spaghetti sauce added so she just ate some of the chicken, pasta and cheese sauce before I put it in the baking dish with the spaghetti sauce. When I asked her how it was, she also said that there was no taste. I seasoned the chicken with Tony's (season all would also work). I also added onion and garlic for some extra flavor. I didn't have enough space in the pan for the spaghetti sauce, but it was delicious as a cheesy dish. I might add some mushrooms next time. It would have been rather bland w/o the onion and garlic for sure.